The idea of visiting Africa without going on a safari was appalling to anyone who had visited before. Even people are not self-proclaimed “animal lovers” would say that a safari ranked near the top of their travel adventures. Still…I did no pre-planning, just in case I opted out, and only made the final decision to go when I arrived. When I arrived in Arusha, I asked about a safari at the hotel desk and was directed to the restaurant manager who walked me for the equivalent of a few blocks to meet with a safari agent. I settled on a three night and four day option that included trips to Lake Manyara, Ngoroboro, and Serengeti. Here’s another unexpected surprise about Africa…it is darn expensive…more expensive than I imagined. In an effort to cut costs, I decided on the “camping” trip that was at least $1,000 less than closest lodge option. The restaurant manager and tour director drove me in the pouring rain to withdraw the money to pay for the trip…over $1,000,000 shillings! It sounds like a lot but was about $650 for the four days of tours, park fees, guides, and camping accommodations. It was actually a great deal. I returned to the hotel because the rain was not only pouring down, but the sewage systems make drainage slow, so the streets were too flooded to comfortably navigate. Being back at the hotel gave me time to be online and also to start worrying about the safari. I am not a worrier, this is my first time of the trip, but I looked at prices for similar tours online and started to question why mine felt so inexpensive. I thought about how much time people spend researching safari companies and began to wonder if my operation would be less safe or how qualified the guides would be. I have read travel blogs where people talk about shady tour companies and started to picture myself getting eaten by lions or stranded in a tent surrounded by hyenas. I felt a bit alone…like who really wants to sleep alone in a tent surrounded by danger? Worrying about this safari kept me from sleeping soundly. I tossed and turned and woke up feeling cranky and a bit rude. You would have thought I was going to jail instead of a safari. I was near tears as I crankily packed a $10 backpack that I bought for this little adventure. I was short with people and was annoyed when the front desk called to tell me the trip was starting earlier than planned and I should head downstairs to get moving. A van picked me up at the hotel and we picked up another guy and headed to Lake Manyara to join a group in progress. In the van, I was uncharacteristically quiet and when we joined the rest of the group, it took some time to warm up. I couldn’t figure it out. This was exciting! What was my problem? We drove through Lake Manyara National Park in a van with a pop up you where you stand on the seat to see out of a slit below the roof. 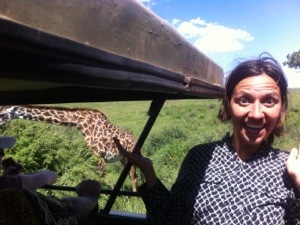 As I watched the monkeys, zebras, elephants, and giraffes, I slowly warmed up and started to feel better about the trip. This park was the least dramatic of the safari with better views and animal sightings expected in Ngorongoro and Serengeti. By the time our vist was complete, I was chatting again, appreciating now nice group members were, and peering out to take a peek at monkeys in the road. We arrived at camp for lunch and an introduction to my tent….and you know what…it was all good. I sat inside and was very comfortable. There were six other tents around which comforted me that I would not be totally alone if danger called. The first day was organized and details were addressed with care. I was ready to enjoy the safari now. In the afternoon, we walked to a nearby Masai village. There were children wandering and a few shyly looking our way. I sat on a tree stump and as a little girl wandered my way, she coyly played a few international games including high five and clapping games. I have found my iPhone to be a great way to engage with people on my trip. I know…people say to keep electronics out of sight and I realize the risk, but the wholehearted laughter of kids who see themselves being photographed or filmed is so worth the risk. We started interacting with me sharing a few pictures and them asking with every photo, “America?” I have one picture of Josiah and Pawdoh with an actor from Blue Man Group that always elicits a startled reaction. They love a picture of Jason dusting off a snowy car, give an excited “Ahhhh” with Ursula’s wedding photo, and seem awed by the large high rises and architecture of Chicago and New York. After warming up with a few pictures of one, they are ready to take a few of their own and like the back camera that works like a mirror where they can pose and click at the same time. We posed again and again so everyone…by now a large group of kids…could each have a turn clicking the button. After we exhausted enough poses to fill my camera’s memory, I showed them how to use the video feature and soon we were watching shows of cartwheels and flips. Kids were being flipped by adults and there were laughs galore. The guys lifted the kids again and again like they were light as feathers…much to the delight of everyone. We returned to our camp, had dinner, and I headed to the tent. I snuggled into the backpack and listened to the bugs all around. It was dark and while the mattress wasn’t lush, and there was no pillow, I had a few nice hours of sleep. So…yesterday, I said that the tour company seemed organized. Well, maybe I spoke too soon, so I will eat those words. Today was the safari that never was. We woke up early and headed to Ngorongoro. Our guide said that we had to make a stop to meet up with someone coming from Arusha to bring us tents and equipment. Our van stopped at a small store and we waited in the parking lot. I was busily writing a few postcards as I listened to my group grow increasingly frustrated. The man next to me told our guide, “These people may not be upset, but I am French and we are not happy people.” I kept writing, but had to smile. Our promised thirty minute wait turned into three hours with the guide nowhere in sight. I was a bit away from the group sitting in the small store and charging my iPad, but I could hear their anger escalating from where they sat outside. A few people stepped up as positive leaders…Tom, Leah and Trevor kept the group on track while one guy, an Austrian who prides himself on all the traveling he has done, walked past me four times on his way to buy beer. Once we acknowledged that we probably weren’t going anywhere today, the group decided they would ask to extend the trip a day. My heart sank…I already felt like I was stretching my capacity to be with a tour group and without washing my hair, so the idea did not appeal to me. Another guy has to leave either way on Saturday to catch a flight, so I asked if I could see Serengeti for one day only and head back with him. Right now…no answers for anyone, but I am back at our camp from last night with a frustrated group of people. The tipsy Austrian is lecturing me about how I am traveling too fast and should just stay the extra day. I am almost ready to tell him that the idea with being with him for another day is a key reason for my desire to leave on the originally scheduled day. Don’t push me, buddy! We have learned that the guide was actually waiting for a money delivery to cover our park fees, which never turned up. It is 2:00 pm and these are the joys of traveling in Africa on a budget. Our money never showed up and we spent the afternoon hanging out at a small bar in a nearby village. Bar meaning table on sidewalk that had beer. We were in safari limbo…and I knew people were getting desperate for entertainment when the guys were hanging out watching “Breakfast at Tiffany’s” on my iPad and discussing Audrey’s beautiful dresses. I am really starting to like my tent and even ventured out for a bathroom trip in the middle of the night. Wow, I never saw stars that looked so bright. I learned a good lesson, too. All tents look alike in the dark of night. I stayed up late in the common dining area reading my book. I was so close to the end that I didn’t want to take a break. I finished Nelson Mandela’s autobiography and it was one of my favorite books ever. I will write more about that later. Anyway, I turned on my flashlight app and headed to my tent and noticed that they added a lot of extra tents to the mix. Shoot…I thought mine was the second from the end, but now there were more tents and they all looked alike…and everyone was sleeping…and it was really dark…and when I walked into one that I thought could be mine, a man said, “You weren’t who I expected.” and I agreed that I didn’t expect him either. I finally found mine and considered it another lesson learned…counting tents as a landmark for my own tent’s location is not a good strategy. Right now, our group is in the van heading to the bank to see if money was deposited for our guide. If not, the group will have to develop a consensus on how to proceed. We know that we will head to the park and show them our contract and hope they let us in…just to be good tourist ambassadors. If not, I am in the group that says we go ahead and pay again and just keep going because how many times will we have this chance. Developing a common idea about how to proceed may be a challenge. I received on email from Naomi yesterday. On the evening before she left Zanzibar, we talked about how it can get tiring to never be able to put your guard down for a moment. Wherever you are….whatever you are doing…even if you are locked behind a hotel door…you have to be aware of your surroundings when traveling alone. When she got off the ferry in Dar, she chatted with someone who said they had a free ride to the bus station and offered her a ride. It ended up that they robbed her. She was safe, but frustrated! It was an awful way to be reminded of the risks of traveling, importance of being appropriately suspicious, and the need for lots of prayer. As the day progressed, our money was deposited after two hours of waiting and we arrived at Ngorongoro at noonish. It is actually a huge open crater area that measures about twenty kilometers across that is filled with animals as far as the eyes can see. There are zebras, wildebeests, hyenas, elephants, warthogs, buffalo, and birds living in relative harmony across the area, and every once in a while, you pass an open space where no animals are lounging. Generally, this means that a lion is nearby. Ngorongoro has five lion prides and we were lucky enough to see a a few, with our favorites being two lounging males just a few feet from out van. It definitely looked like a scene from National Geographic and our few hours of driving was just enough for me. We are able to stand in the vans which is nice, but I think six hours of animal spotting is just the right amount of time. “You get what you pay for…” Continues to be the theme of the safari. Our campsite was on the Ngorongoro grounds and we were the only group who did not have tents ready, did not get a lunch, and whose neighbor’s dinner left our men salivating with desire. Our dinner was the greatest infringement of my “no mixing fruit and non-fruit” rule ever. We had whole bananas cooked in tomato sauce with green peppers and ladled over spaghetti noodles. I settled for plain noodles and headed to sleep. What a night!!!! I went back to my tent feeling confident because I had survived two successful nights as a tent girl…and was almost considering myself a tent enthusiast. Our camp is situated on the rim of the crater so the elevation is quite high and the temperature dipped quickly. I used every strategy I could think of to warm up…adding clothes, rubbing my feet together, and trying to stuff my feet up into my pajamas legs. Nothing seemed to work and soon I had to visit the bathroom across the camp. I left my main suitcase at the Arusha hotel where I will return tomorrow and unfortunately, my glasses are there, too, so I was navigating the camp with limited vision. I made it there without a problem… probably about 2:00 am at this point. On the way back, I felt confident that I would find my tent because we placed a water bottle outside of it. I saw a bulky movement in the distance and thought it was a group of people walking nearby. I squinted and waved a small greeting when I decided it wasn’t people, but an animal. I was suddenly wide awake enough to see three buffaloes less than ten feet from me…staring curiously my way. They were bigger than cows and had big horns. I am reading a book recommended by a friend called “Whatever You Do, Don’t Run” written by a safari guide, so I didn’t run, but tried backing up to my tent, which of course I could not locate. I saw three buffalo because they were close, but was sure there must be hundreds that I couldn’t see in the distance…maybe I am exaggerating, but there could have been. I saw movement at my feet and instead of a wild animal, it was the my sole human companion whose head was peeking out of his tent with binoculars watching the buffalo show. I scooted down near his door and kind of pushed myself into his space. He spoke limited English…I didn’t pay enough attention to him to notice what language he spoke as I jumped halfway into his tent and waited for the buffaloes to leave, which they did not. I knew his English skills were poor only because he answered my repeated questions like, “Do buffaloes bite? Do buffaloes kill people? Can buffaloes hurt you?” with the same answer…”My English no very good,” even when I tried to use body language like a charging buffalo with a horn in my belly and me dying, I got the same answer. The tent guy did seem a bit awkward about my pushy arrival, but I was not worried about his feelings when he gave a yawn and said he was going back to sleep. I think my shaky “Don’t leave me,” plea convinced him that his only hope for sleep was to help me find my tent, which he did, and I laid down to listen to the buffaloes for the next few hours…wide awake and not so cold anymore. 12:00 PM And, now…we are waiting at the gate of Serengeti National Park because we have no money AGAIN to pay for our tickets into the park. At this point, like a wild animal, I am starting to recognize some of the fellow group members, particularly my seatmate who has not showered or changed his shirt in three days, by their unique scents. 2:00 PM: After waiting a short time, our guide received a text from the tour company saying that he was unable to deposit money and that we should pay our own fees and he would reimburse us when we returned to Arusha. At this point, our group had no faith in that agreement and we opted to tell our story to the park administration who graciously let us in for free and who will honor the scheduled accommodations. They took copies of our paperwork and will file a police report on our behalf for all of the breeches to our contract. We are on the way in. 3:00 PM: Serengeti Plains are beautiful. There are all kinds of beautiful animals. It’s funny because after a few days, things like giraffes and zebras in the road feel very common and I have to remind yourself what an amazing sight they are to see. 6:00 PM: We are at a new campsite today in Serengeti National Park. There is no power and there are rats climbing on the rafters in the dining area. I am “the little engine that could.” To myself, I say…”I think I can. I think I can. I think I can. This is our last day together. We woke up early for a morning safari before heading back to Arusha at 10:00. The group has grown weary…not of the animals, but of each other. We are rushing to get out so a few can make their flight connections and people feel stressed. This was a hard few days, but also really good. I met some nice people, feel excited about camping, glad to have had the experience, and satisfied that I did my best to make it a good experience. The French man told me at the end that he was waiting for me to get upset about something and can’t believe I never did. He said…”no matter what bad thing happens you are smiling, like you think it was funny or something.” He had no idea that at a few moments, even more than praying for peace, I had to repetitively sing “Let there be peace on earth and let it begin with me” and “This little light of mine, I’m going to let in shine” over and over again and that might have been what I found to be so funny! I am back at the hotel now and expect it will take hours to get the tangles out of my wind blown and dirty hair. Africa is a challenge, but a good one that is building new skills for future things. This entry was posted in Africa, Tanzania, Travel and tagged Africa, Safari, Tanzania, Travel. Bookmark the permalink. Nancy u r amazing, i don’t quite know how you do it, but by the grace of God u do! The stories u will be sharing with your future students will be fabulous! I am thinking about going back to school whatever grade you will be teaching! Prayers continue for joy, peace and safety. I am counting on you to be a volunteer!!!! I am so happy you are enjoying this trip with me! It is so fun to have friends nearby! Nancy, seriously it did not surprise me the paragraph regarding checking on the money part and stopping for a consensus on how to proceed. This is going to be a fantastic documentary, novel, or however you decide to handle this adventure. Nancy, I so enjoy your blogs of your travels. What a crazy safari adventure; love your little tunes to make the best of it! It will probably take years to process all you have seen and experienced over the past months. I am picturing you in the tent surrounded by wild animals— :). Stay safe and happy travels. Just finished semester one; miss you!!! That was such a perfect capture of that safari trip! Good writer you are! And you really are the queen of patience, you were the one that help the group together with your positive energy! Oh Mr. Soter… the person that bonded us all together, haha. Tom said it well, when he said that when he looks back on our safari adventure he only has positive memories!